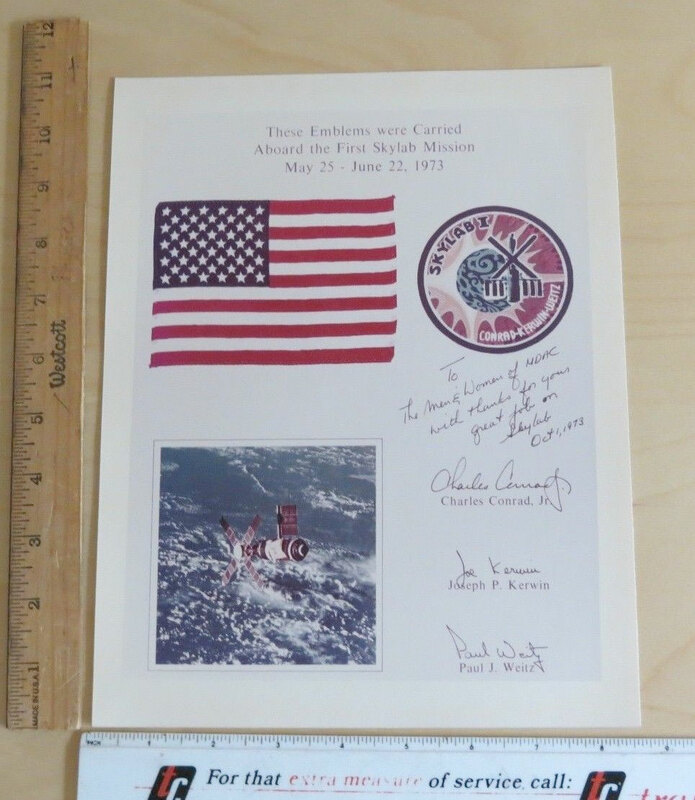 This is a presentation of the US flag plus Skylab SL-2 emblem, signed by Conrad. Kerwin, Weitz on the presentation sheet. Is this genuine or autopen or neither? Well, considering the seller has listed 5 of these with a buy-it-now price of $11 each, it would fit into the "none of the above" aka "stay away" category - it appears it may be a copy of a presentation. The title says photo so it is a photo of the original item. The original display was 11x14, as noted in this past Regency-Superior auction. This photo print is 8.5x11. Based upon the other items the seller is selling, the story is probably legit -- the photos were likely in a box of stuff he/she received, they likely have minor soiling as he/she said, and the seller likely doesn't know anything about them. For 11 bucks, I guess it could be a display piece if you are into that kind of thing. Yes, but the presentation includes a photo of Skylab in orbit, so the term "photo" in the title was for me related to that (three signatures plus flag plus emblem plus photo), not to the item as a whole. To me that is misleading, intention no excluded.